By reversing evolution, scientists may be able to transform chickens into dinosaurs one step at a time. You may remember that in Jurassic Park, scientists sequenced some dinosaur DNA from a mosquito trapped in amber. They made a copy of this DNA, filled in the gaps with frog DNA and then created a dinosaur. Although cool, we’re not likely to get dinosaurs this way in the near future for a bunch of different reasons. The biggest for now (besides not having any dinosaur DNA) is that we can’t clone anything bigger than a bacterium with just a piece of DNA. To clone a multi-celled creature like a dinosaur, we need frozen or even better, live cells. While this might be possible for some extinct animals including mammoths, 65 million years is just too long to find any frozen or viable cells. But there may be another way to one day create Jurassic Park. By messing with a chicken’s genes. Current theories are that birds evolved from dinosaurs. This means that all the information for making a dinosaur was contained in bird DNA at one time. The trick is to figure out what this dinosaur DNA looked like and to change bird DNA accordingly and/or to unlock any hidden dinosaur DNA that may still be in bird DNA. After 65 million years you might think all traces of dino-DNA would be lost in birds. Surprisingly, you’d be wrong. It looks like there is still some T-rex lurking in a chicken’s DNA. In the last decade, scientists have been able to make chickens look a bit more dinosaur-like by changing how the chickens use the genes they already have. 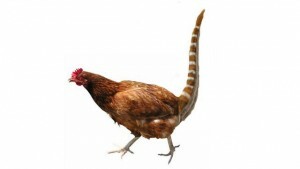 For example, they have been able to make a chicken’s tail look a bit more like a dinosaur’s. A big difference between birds and dinosaurs is that dinosaurs have much longer tails. But this doesn’t hold up in a chicken embryo. At a very early stage of development, chicken embryos have what looks like a very reptilian tail with 16 vertebrae. Later in development, though, most of the vertebrae disappear until only five are left. What this means is that if scientists can figure out how to keep the vertebrae from disappearing, they might end up with a long tailed chicken. And they’ve actually managed to sort of do this already. By changing when certain genes are turned on or off, they have managed to create a chicken with a tail that has eight vertebrae. Not quite a dinosaur but a step in that direction. They have also been able to create a chicken with teeth. And even a snout! All of this without fundamentally changing a chicken’s genes but instead changing how they are used. Now they probably won’t be able to make the chicken-dinosaur transition simply by changing how chicken genes are used. There are bound to have been some significant changes in certain key genes that will have to be replicated to really make a dinosaur. And for that we’ll need to figure out what dinosaur DNA looked like. But still, we can make a lot of progress towards making a dinosaur by simply using the toolkit of current bird genes. In the end, we’ll probably be able to recreate something very much like a dinosaur. The question will then become whether we should. QUEST story on how scientists can figure out ancient DNA from modern DNA. Have you seen the lizards in Central America that look like miniature vorceraptors. We watched one walk down the middle of the street, He walked upright on his back legs. Acted like he owned the street. We were living in Guatemala at the time. The locals called it something that sounds like “taroque” pronounced ta-row’-kee. We tried to catch one. Not a chance! They are too smart. What??? I have 3 words for you: “Ain’t gonna happen.” Grow a tail and some teeth on chicken – that’s a dinosaur? Hey – I got news for you: take a look on the inside – a lot more has to be “re-volved” to make a dinosaur. Things like gonads, pubic bones, etc. Remember – you heard it hear first. @Addison Dewitt I agree a chicken with teeth and a long tail is hardly a dinosaur! But I’ll be curious to see how many changes it does take to change a chicken back into a dinosaur (or at least into something that resembles a dinosaur). What are the chances of finding out if this is true? These lizards look like little dinosaurs. They stood up and walked on their hind legs. Not your ordinary lizards. Have your people heard or seen any of these “ta-row’-kee” lizards as they called them in Guatemala? Someone should check these critters out and stop talking about chickens! So if this happens, dinosaurs will taste like chicken. Instead of trying to reverse evolve these creatures why don’t you scientist try to evolve things on our own. Why not work on the canine species there is a huge amount of different canines why not try to improve the canines. Canines run beside humans right. We actually did sort of evolve all those dog species out there…before a few hundred years ago, there weren’t that many species and a few thousand years ago there was just the wolf. I am not sure we have improved them of late though given the huge amount of genetic problems associated with all those breeds. See our latest at http://science.kqed.org/quest/2012/11/19/turkey-trouble-genetics-gone-too-far/ for the dangers of taking this kind of genetics too far.